Guilt tries to convince you that you are someone which you are not. *Think for yourself. *Draw your own conclusions. *You deserve it. *If you truly desire it the Universe wants to give it to you. *You can have anything your heart desires. *Check back tomorrow for more!!! *Get our best selling ebook...*FREE!! *Click the join link below! Over 280,000 likes on Facebook! Theta*You have come to a point in your life where you have to say...*Enough Is Enough! *You see so many others living the life you want. *Living the life you deserve. *It is your turn! *It is your time! *Right Now! *Get our best selling ebook...*FREE!! *Click the join link below! Get our best seller absolutely FREE! If you like authors like Deepak Chopra, Wayne Dyer, Neale Donald Walsch, you are going to love this book. 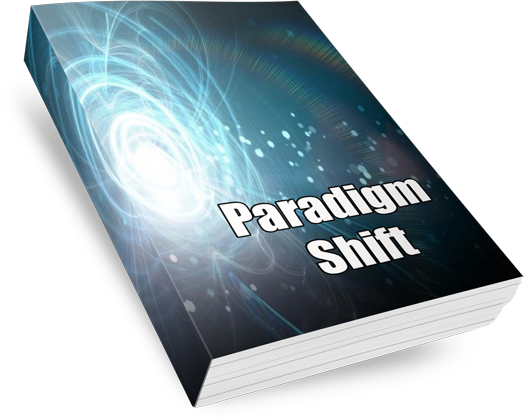 This book contains over 300 pages and 1000s of quotes, sayings, and advice from Paradigm Shift, enhanced with over 300 breathtaking photos. You will love it. Click here to subscribe to our FREE mailing list and get your FREE copy of our best selling book. This world is a struggle for so many. It does not have to be. This world can be a magical place. Our mission at Paradigm Shift is to show you just how incredible this world can be. To take away the struggle. For the most part your brain was wired when you were a child. You may think you have come to conclusions on your own, but your brain has been conditioned to see the world in such a way to support conclusions that were given to you by your parents and society when you were very young. Did your childhood limit how you see the world? Do you think your way of viewing the world is the corect way to view the world? Do you think there are those out there experiencing a completely different world than you? Are there those out there experiencing a world that you think is impossible? Are there those that everyday see things you don't even think exist? Your brain is bombarded with millions of bits of data every day. To keep you from going insane your brain takes in the data that conicides with your beliefs and discards the data that does not. You do this subconsciously. Most of the time you are unaware. This is why the world seems to conform to what you believe. Most of your beliefs were determined when you were a child. Are you discarding important data because of what you were taught to believe as a child? Since everything is energy, there is no distinction where energy begins and ends. Therefore we are all one. We are one, unlimited with endless possibilities. Everything and everyone are one. But that does not mean you are not unique. You are like a wave in the ocean. You are the individual wave but you are also the entire ocean. Everything you do affects everyone and everything. There is a collective unconscious. We all share all knowledge. If one person knows it be assured that information is available to you. Again, we are all one. You are here to create! You are here to create your world any way you want. To create, use your imagination. Picture anything you want in your mind and add emotion. Hold that for just a minute or two each day. It is that simple. There is nothing you cannot do be or have. Even after this life you are still creating. You are creating infinite creations for all eternity.